Husky is a household name in the American workforce. They’ve been around since 1924, founded by Sigmund Mandl in Milwaukee, Wisconsin under the name Husky Wrench. They have been acquired and sold several times over their lifetime by big tool manufacturers like Stanley, National Hand Tool, and plenty of others. Today, they are best known for being ever present on the shelves of Home Depot, who now owns the brand. 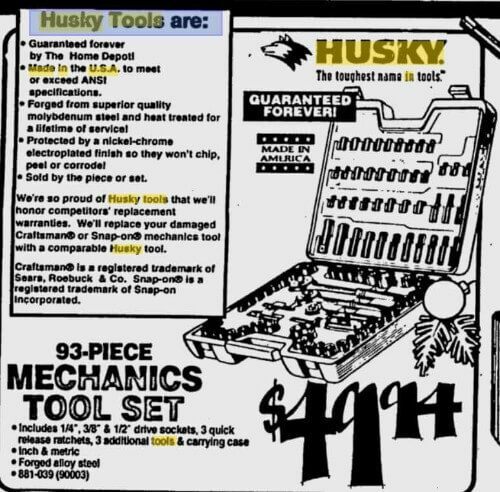 Husky makes a variety of hand tools, air powered tools, and tool storage options – but are they still made in the USA? We dug in to find out. Verdict: Are Husky Tools Made in the USA? No, the vast majority of Husky tools are not made in the USA today. Most of their products are now manufactured in China and Taiwan, following the trend of many other Home Depot brands and other tool makers. This is extremely disappointing, given their long history of American manufacturing. Husky made the move overseas around the turn of the 21st century. They used to be loud and proud about being made in America, which you can see below in the newspaper advertisement that we found from 1996 when the company was owned by Sears. Courtesy of the Walker County Messenger – Dec 11, 1996. Head over to our tool brands made in the USA guide to look for alternatives to Husky. If you’re looking for hand tools, check out our guide on alternatives for wrenches. Are DeWalt Tools Made in the USA? Are Milwaukee Tools Made in the USA? Are Snap-On Tools Made in the USA? Are Craftsman Tools Made in the USA?